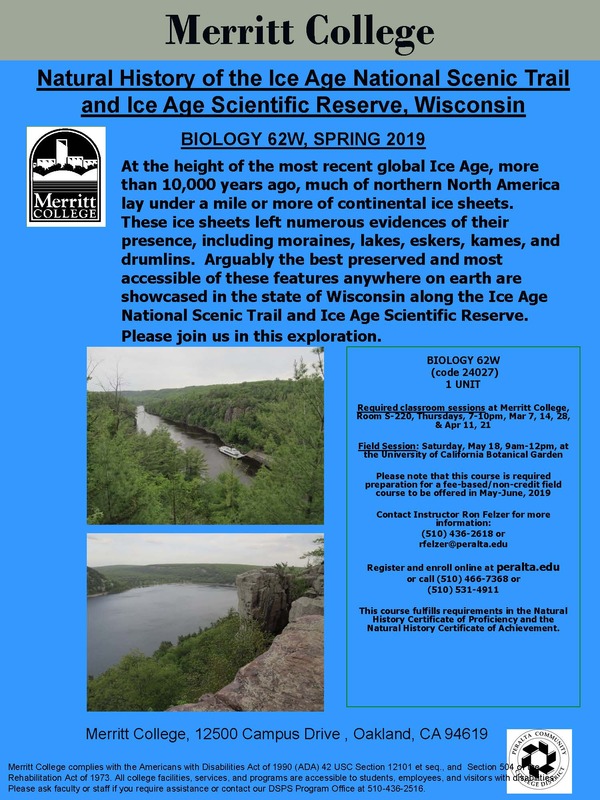 After a first successful Fall semester in the new Natural History and Sustainability Program, the second semester in Spring 2019 offers even more classes and a wider variety of topics. These 14 classes have been chosen from multiple disciplines by Program Director Brad Balukjian for this semester to educate students about the biodiversity and ecology of the Bay Area and beyond. They run from full-session to short-term courses throughout the semester, some being introduced for the first time. You can find all the classes listed here. They have start dates from January to March. Click here to enroll by January 8. 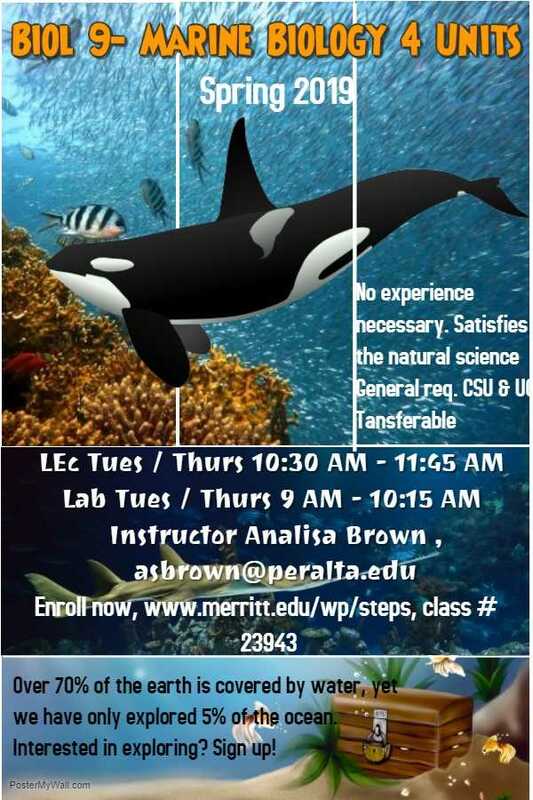 Some of the classes, highighted in flyers below, include first-time class Marine Biology (BIOL 9) taught by shark expert and biologist Analisa Brown (asbrown@peralta.edu) as a full-semester class starting January 22; another first-time class, California Indian Ecology on the Central Coast (NARAM 76E), is a short-term Ethnic Studies class starting March 1 by faculty member Darby Price, who has been offering classes in Native American Studies, Ethnic Studies, and Environmental Studies throughout the Bay Area for many years; and Natural History of the Ice Age National Science Trail and Ice Age Scientific Reserve, Wisconsin (BIOL 62W), taught by Ron Felzer, a legend in the Natural History Program at Merritt, who has spent decades taking students on field trips around the world. His short-term class starts March 7. Click on each flyer to enlarge and read more, and feel free to contact the instructor with any questions at all. For overall questions about the program or to get more information, go to the NHS website or contact Program Director Brad Balukjian at bbalukjian@peralta.edu.